If you are planning to catch Wahoo, try going around a new moon, as it considered a prime time. Similarly, the week before a full moon is also an ideal time. 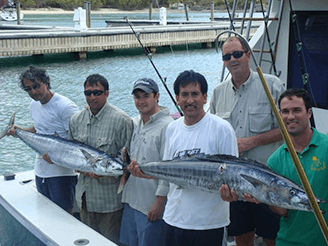 It is easy to catch Wahoo in Miami or Miami Beach if you take your boat to the dark indigo blue Gulf Stream water. You can locate it below the surface or on it. If you are choosing live bait, go for blue runners, pinfish, herring, or pilchards. Bonito strips, ballyhoo, and rigged swimming mullet are suitable if you are considering trolling baits. It is the most common method for catching a Wahoo. If you plan to go for a high-speed troll, try going late in the afternoon or early in the morning. To increase your chance, choose areas with current and blue water. Some anglers try this technique in which a dark jig is dropped down a few hundred feet. It is then ripped towards the surface to get a catch. We hope that your next trip will be more fun and adventurous. We, at Fish Jumanji, always strive to delight the anglers through Wahoo fishing charters in Miami, Florida. Our crew is quite experienced and fun to hang out with. The professionals will take you to take you to the location where the chances of success are highest. You will feel delighted after learning multiple techniques related to fishing.